My name is Wlodek as in « Vodka ». I am originally from Poland but have lived almost all my life in England. Now, I live in France devouring the best of food and company. My French language still leaves plenty to be desired. Recently, by way of mutual friends I found out about this beautiful adventure of Olivier and his beloved Enjoy (though sometimes he addresses her in some other words). Sailing for me is the next best thing to French food and English weather, therefore I did not hesitate to join the « Enjoy » for a while to see if I am worthy of her. You, devoted readers of this blog, no doubt know that the initialisation of this trip began at least a year ago. The first stage of the trip was accomplished by « flying » over the « pond » (as the Americans would say) in 17 days…of which 4 were dedicated to fishing. The »Enjoy » had a nice little rest in Rio de Janeiro and so has Olivier. Nevertheless, the call of the sea prevailed and at 21h00 on the 14th March my own voyage began. Ok, I was 5 minutes late from Paris to Urca beach mooring, but thanks to the local cab driver whose name was Antonio Senna ( brother of Ayrton Senna ) or something like it, we have made up most of the lost time. Following a proper French breakfast, Oliver introduced me to his friend Philip who travels the world on his own on the fine 43 foot yacht called « AZAD ». We got an account of all the local gossip, then exchanged a few opinions on the recent local events taking place in the bay of Urca beach. SHOPPING TRIP the usual but visit of the Inca Catholic Church in the middle of Rio was quite something. In the evening we popped in to our neighbours’ and as it happened stayed with our wonderful hosts Olivier and Patricia for the rest of the evening. That evening will go in to the history books as « The Camembert Evening » . For bringing it in good order from France I have nearly landed myself the equivalent of the « French Order of the Empire ». Lay in bed a bit longer than usual. 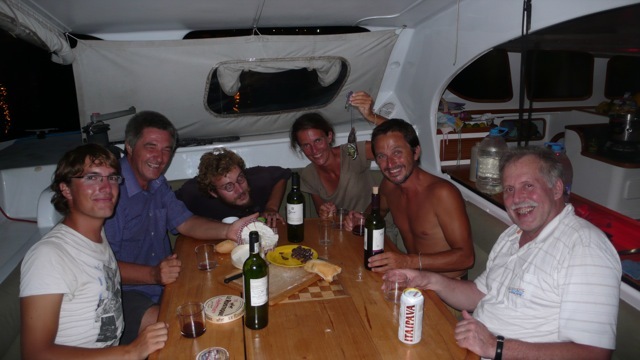 Philip arrives at 10 and we all set to work on a few problems on the boat of Olivier’s friend Paulo. He is member of the yacht club of Rio. Navi lights repaired and working, we were invited for a lunch in the club house (few minutes dinghy ride from Urca beach). The day being very hot (40 C) we accompany the local food buffet with a few cool drinks (no wine in sight). All this followed by the first real siesta. The evening ending with a Brazilian adventure film staring J P Belmondo with the pink Cadillac in green stars. Start of the day with a proper French breakfast and supply shopping trip to the local grocers. Big lunch at local bistro starring the usual trio and some crowd from Brasilia France and Poland join in. Apparently Olivier got « Hero of the Empire » medal for rescuing some Polish woman in distress the previous week. Evening: the additional crew arrived in form of Benjamin and Pierrick. The run started at 21.00 on the 14th March when we went around the Sugar Loaf Montaigne and took direct south along Copacabana beach. Wind mostly north to north – east took us out of Rio vicinity and by 1.00 am the Corcovado has despair from our sleepy eyes. Lovely run of 24 hours with the full sail brought us by midnight to the vicinity of Illa Bella. The lighthouse mentioned to be seen for 15 sea miles never showed from the direction we came (heading 255). It is obscured by land and two little islets on the way: can become an obstacle to avoid at short notice ( This is an official warning). 6th – Fishing and arrival at Ilhabela. The sunrise found us approaching the Ilhabela island from the Atlantic site so we can go around it towards the San Sebastian canal. There is a natural reserve at the very tip of the island yet further one can throw the line and try some fishing. Yes, we did almost catch it. A monster, at least 50cm, with a huge mouth was nearly landed but before we could reduce speed by reducing the sails, the line broke. This meant to put us off sailing but I am afraid the fish lost the contest and we got quite satisfied by having its cousin for dinner. That evening we saw our new crew off to go back to Rio. The transport on our side of the island is limited to two prehistoric buses running some undefined route between the ferry port and Villa . Our place of moorings is situated close to the former. Last night Olivier left his new hat on the bus returning from the ferry port. You should have see his face when we found it lying next to the driver on the bus we took today for a trip to our favourite « Restaurant » in the mountains. What luck. It rained silly all day – no wonder, start of the rainy season here. Visibility zero at sea as well as inland. Major repair done inside (the GPS working and at easy access). Closing the evening with fried eggs and another comedy on the video. Enjoy’s adventures are still going on thanks to you Wodek and your writing. You seem to really be sometimes « into the wild » I miss that for sure.